Jamie humbly apologises for not updating the weather blog for 10 days. Several reasons - getting busy at work with high season just about kicking off for scuba diving, also our internet at home is broken, plus it has been the Phuket Vegetarian festival, which ran from 17th - 26th October. The weather at this very second - raining.. again. For the last 10 days almost every day has had some rain, but mostly in the night. The seasons are changing now. This is not monsoon rain, just a good old tropical downpour. There has been hardly any wind, the South West winds stopped blowing last week.. and today there was a noticeable North East breeze. Clouds were drifting across the sky from that direction, so I think we can say.. as far as weather is concerned, it's high season now. Time to dive! The main season for scuba diving starts now, although there is some decent diving year round if you get good weather. Our number 1 destination is the Similan Islands, the best diving in Thailand. At Sunrise Divers, we can offer liveaboard trips from 2 - 10 days to the Similans and even into Burmese waters. We also have day trips to many sites, overnight trips and we're a PADI 5 star dive resort. Hope to see you at our shop in Karon Beach! Here's a couple of photos from Vegetarian Festival street processions last weekend. 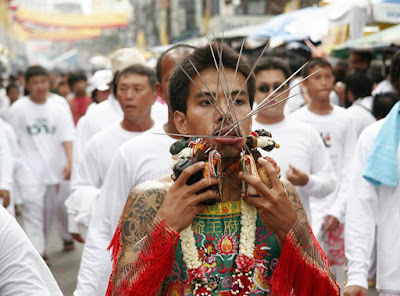 For a lot more, have a look at my Phuket blog: Vegetarian Festival Photos 2009. I do love the vegetarian festival! And it's festival season here right now... let's ignore Halloween, although my daughter will be dressed as a witch at school tomorrow... On Monday it's Loy Krathong - have a look at some photos from last year : Loy Krathong Festival 2008.